The late Phineas Taylor "P.T." Barnum, 1810 -1891, is known to most as 'The Great American Showman'. However, Barnum, who described himself as the "Prince of Humbugs", was a brilliant entrepreneur who understood and used behavioral psychology to achieve success in several endeavors. "No one ever went broke underestimating the intelligence and common sense of the Average American"
Publicly called the slaughter of innocent Americans at Ft. Hood by Muslim Nidal Hasan "work place violence"
GOP and Romney Mute On Critical Facts: It should be abundantly clear that the foregoing facts can lead to, and have resulted in, serious adverse consequences for America. Accordingly, they deserved close scrutiny and consideration when assessing the character of a prospective president. The GOP and Romney knew very well that neither the Democrats nor the MSM were going to disseminate negative information about Obama to the public. However, they inexplicably chose to remain silent leaving the same citizenry that previously elected Obama unmoved, on its own to gather information, or still ignorant of and indifferent towards his character. For the sake of brevity, throughout the campaign Obama consistently went for the knockout while Romney cowered in his corner shadow boxing... and predictably lost! Obama Destroys America's Culture: The result of Obama's second term is that he and his ilk of anti-Americans continue destroying the traditions, cultures, and values of our once great country with the willing support of Congress while the citizenry watches. He is allowed to rule absolutely as a virtual monarch by his Congressional sycophants from both parties and clearly controls the Marxist majority on the Supreme Court. Stay tuned because Obama's mission is far from complete and when his work is finished you will not recognize America as it was in 2012 when he was tragically re-elected. Obama certainly must have channeled P. T. Barnum because electing him to serve a second term spoke volumes about the average Americans' intelligence and common sense. 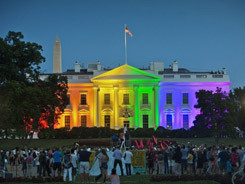 In my opinion thus far the ultimate insult to America and the office Obama has willfully besmirched for the past six years was proudly illuminating the White House in his beloved LGBT colors pictured here for the world to view and mock. His typical uncouth boorish act confirmed to the world that America has lost its standing as a bastion of strength, and had to eliminate or significantly reduce any remaining international respect. I also have a big sick spot in my stomach that he'll call Marshall Law before he is gone, because he's NOT going to leave!I just had a feeling over 8 years ago he was going to be here for the Long Haul. I had it written on the back window of my truck..."Wake Up White America For Your Are In Double Trouble", even then I knew he'd have a second term. And that was during his run, he hadn't even been nominated by The DNC yet. Woman's intuition I guess, LOL. He has put on a minstrel show from Hades. Well said! My baby brother works with DNC as an Attorney as well with his wife who is an Atty for MIT and I called him ALOT during the first election and his tone was grim but would not elaborate. I now know why. I am a registered Republican when for years I hid under the guise of unaffiliated as to not be in confrontation with him. I have not spoke to him in over a year and he may never speak to me again but in 50 years he hasnt cared much no how. So I proudly now have the signs in my yard for my future President Donald J Trump! Great post and so true. This guy is trouble and look for imposition of Marshall law no matter who is elected and he will not leave office. Prepare for the worst! I believe that the only way our country may return to it's true Christian roots is if a true Christian is elected into office, or this false interloper can finally be impeached by those with true fortitude; else we are looking at a second American Revolution, and it will be fought with countries who have no business fighting on American soil, except for the purpose that they belong to the United Nation- that's the war obammy wants so he can be the dictator who has divided this country in his devious ways and manners. I so agree with everything that I read on this site. I just want to get out country back. Back to our Christian values our freedom to carry our flags with pride. How do we do this?? ?